The Glasgow Passport Office is the only passport office located in Scotland. 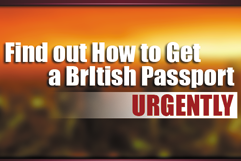 Certain documents are required to obtain a British passport, you will require a completed application form. this form is not available online and you must hand write the application on a paper form, which will be scanned at the passport office. These forms are available from any UK post office. You must also ensure that you bring the correct fee to the appointment (you can pay by cheque, cash or credit card- except American Express) and bring two passport photos which adhere to the strict regulations regarding passport photos. In some cases additional documentation will be required. The interview will last approximately 30 minutes and basic questions will be asked about your identity. Before you attend this interview your belongings will be x-rayed, so it is important to ensure that you do not have any sharp objects on your person or within your belongings (such as nail files) or you may not be allowed to attend the appointment. It is also important to arrive early so that you can pass through security. Passports may be renewed or replaced at any time and the time remaining on an existing passport will be added to the new passport, up to a maximum of nine months. This service takes a minimum of three weeks, but should be undertaken sooner if the passport has reasonable wear and tear as you may be denied travel if the passport is damaged. If you are an adult aged 16 or older, the standard 32-page passport fee is £72.50 while the post office passport check and send service is £81.25. Upgrade to a 48-page passport and fees rise to £85.80 and £94.25, respectively. Children under 16 may obtain a normal service by post passport for £46.00 and a post office passport send and check for £54.75. Those born on or before September 2, 1929 are not required to pay a fee for a passport. 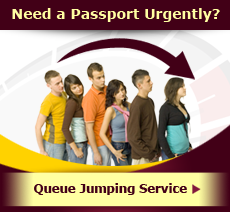 Passport fees for the Fast Track and Premium Services can be found here. For those looking to obtain a Premium Passport or a Fast Track Passport, the fees will be higher. To renew or amend a standard adult passport will cost you £128 using the premium service and £103 using the fast track service. For those looking to renew or amend a jumbo passport, the cost rises to £137 and £111, respectively. To replace a lost, damaged or stolen adult passport costs £103, using the fast track service. For those looking to obtain a first child passport, renew or amend a child passport or replace a stolen, lost or damaged child passport, the fee is £87 using the fast track service. The premium service is only available for those looking to renew or amend a child passport and the fee here is £106.50. 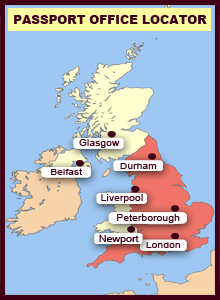 The closest passport to the South of the Glasgow Passport Office is the Durham Passport Office.